I was born in a country that now only exists in history books and people’s minds. When it fell apart, I was busy being a conflicted teenager, wearing ignorance like a cloak. Flags changed along with street names and money, but home, home stayed the same. It wasn’t until the first time I moved out of Slovenia that I had to pause and think when asked: ‘When are you going home?’ For me, home was right there, in my tiny room in Berlin with tablecloth curtains and a crate posing as a nightstand. Two years later, I moved to Brussels, adopted two cats, got married and acquired an addiction to fries with mayo. I would have been happy to stay there a bit longer, taste more beers and give the cats a chance to finish their wallpaper scratching work, but it was time to leave again. 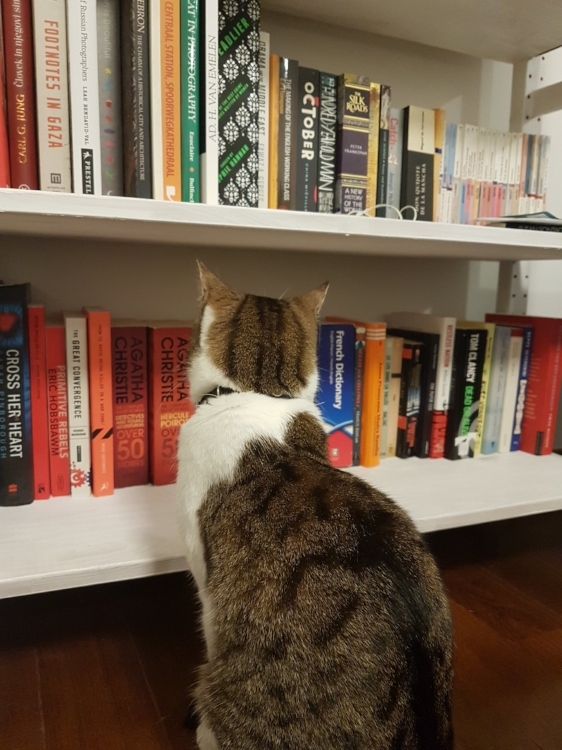 HRM Nitzan choosing her next read. For the next four years, home will be São Paulo. There’s no wallpaper here, so the cats reluctantly agreed to practise their art on the furniture. After Brazil, who knows? Apparently, they can ship those boxes anywhere in the world. I guess ‘home’ is one of those words that evoke physical places. For me, home was always the place where I lived. This might have something to do with me considering countries somewhat unreliable sources of identity. To my teenage mind, the break-up of Yugoslavia was baffling. Everything was new, except for the thinking. Unsurprisingly, identity is one of the themes I like to write about. Home, though: what is it? A country, a feeling of belonging or someone who tolerates your dirty socks on the floor?